Since the Second Temple Period, the story of Esther is publicly read in synagogue each Purim, the Jewish holiday celebrating the liberation of the Jews of Persia under the reign of King Xerses (485-465 BCE). The Book of Esther narrates that Haman, royal counselor to King Xerxes I of Persia, planned to kill the Jews in the empire. Mordecai, his cousin, and the adopted daughter Esther, who had to become the Queen of Persia, foiled Haman's cruel plans. The day of deliverance became a day of feasting and jubilation. 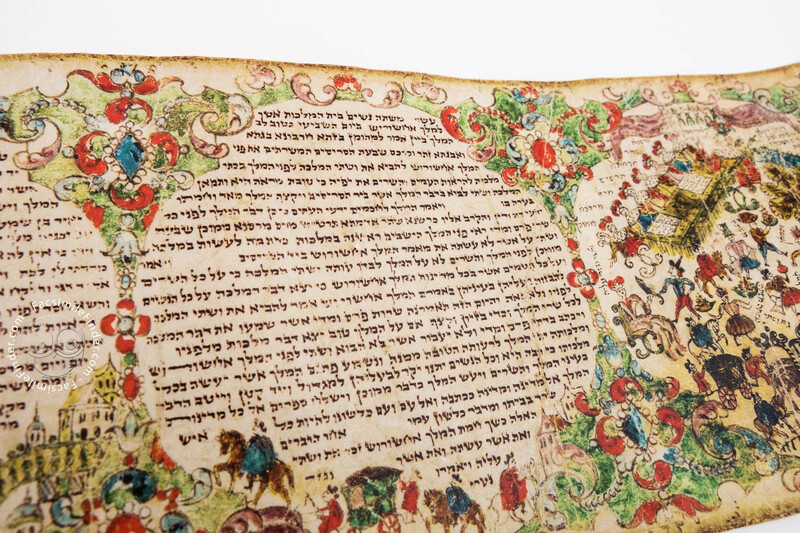 The biblical Book of Esther is read loudly from a parchment scroll called megillat. 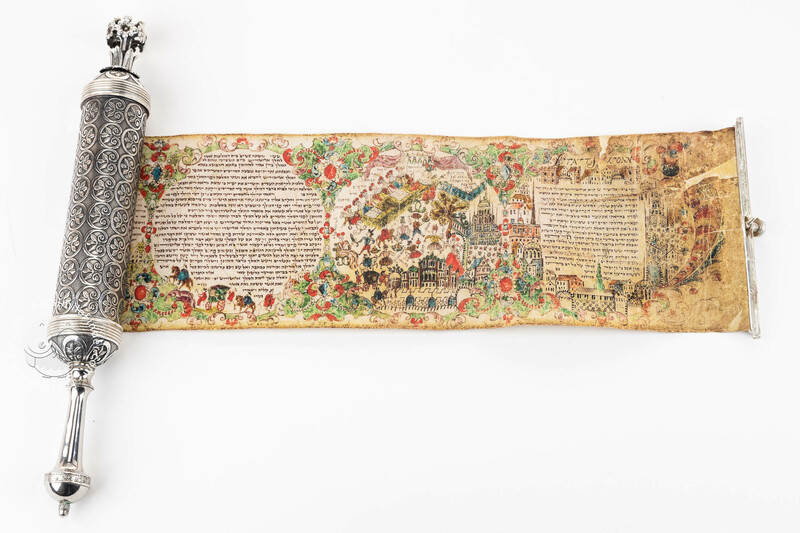 This scroll, treasured in the private collection of the Gross family, is an unusual exemplar of megillat. 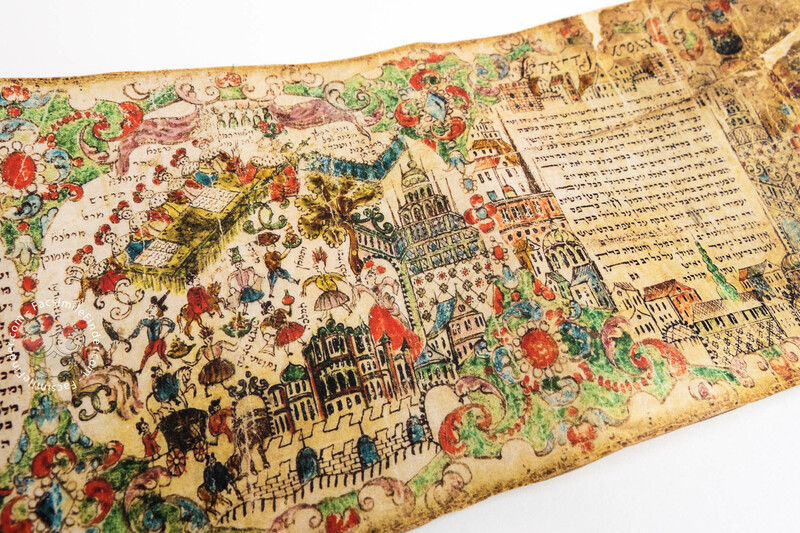 As such, this parchment scroll was used to celebrate the feast of Purim, a day of friendship and joy. 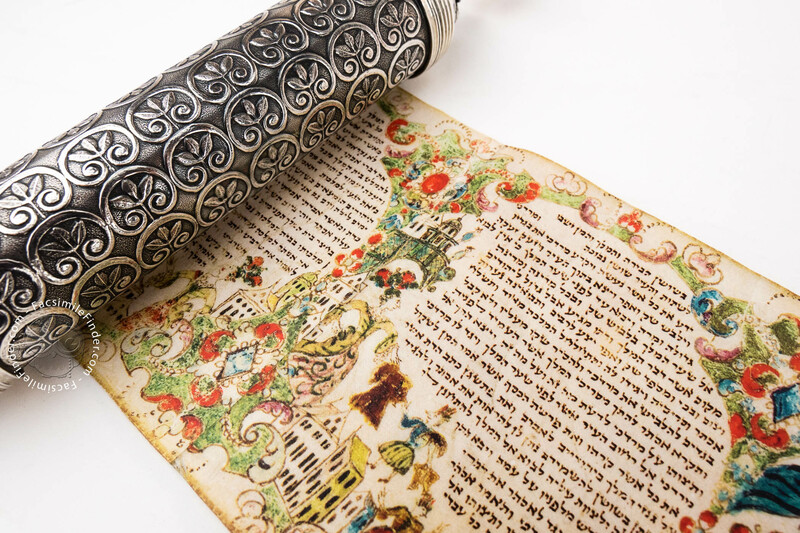 Esther scrolls have become representatives of the celebration of the Jewish tradition. 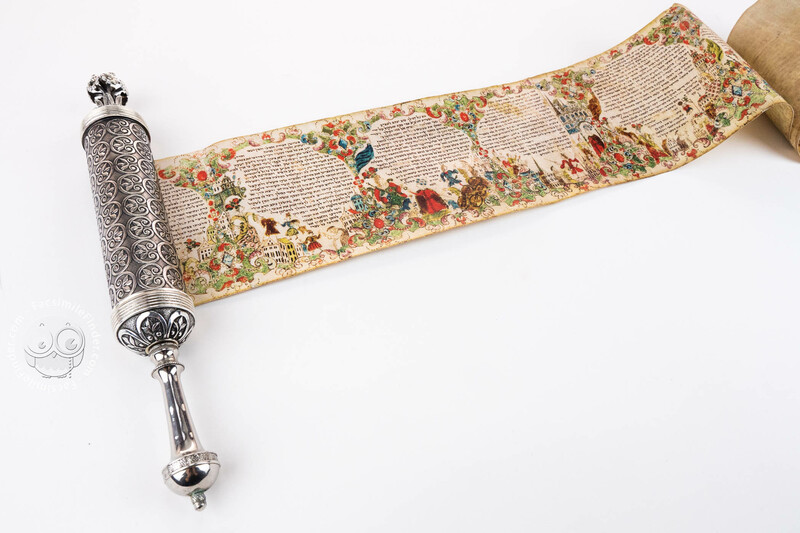 Scrolls containing the Book of Esther are common in major collections. However, it is less common to find instances of illuminated scrolls. This megillat Esther represents a rare exemplar because the story of Esther is illuminated in detail. 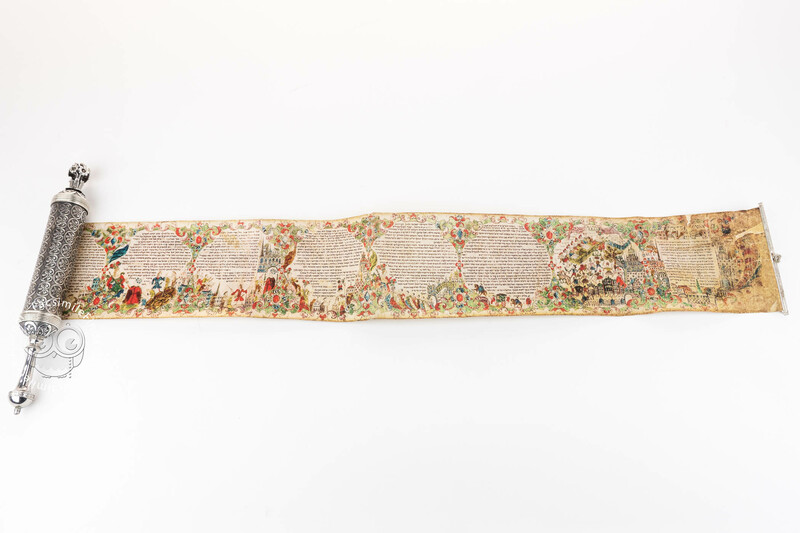 The story of the book of Esther is entirely illustrated throughout the scroll. The miniatures are places in the frames of varying shapes that enclose the eighteen text panels. Baroque buildings and figures dressed in the eighteenth-century fashion bring the story of Esther and the salvation of the Jewish people to a time contemporary to the scroll. 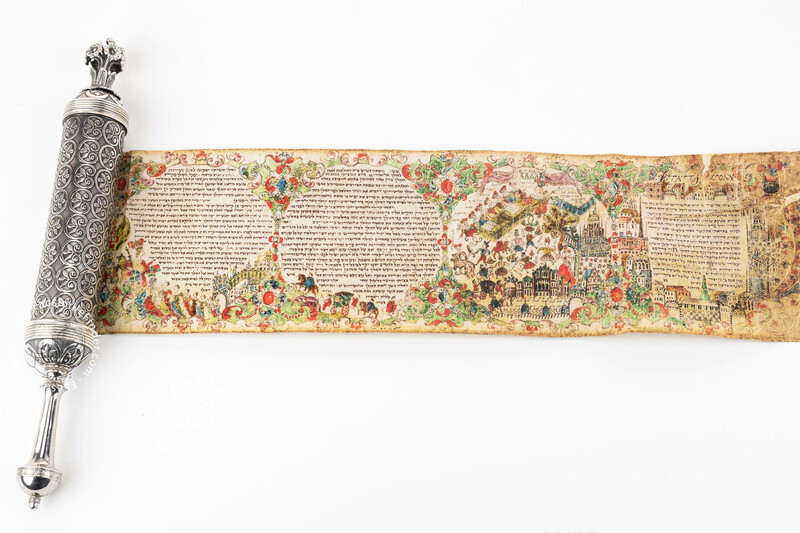 The architectures and the garments of the figures suggest to locate the origin of the Megillat Scroll in Germany around 1700. There is no clear indication of the person who commissioned the scroll. There is a rare inscription at the beginning of the scroll. It writes the words “Statt Shusonn” in Latin alphabet. This inscription reinforces the German origin of the Megillat Scroll. Another Esther scroll, now kept in the Library of the Jewish Theological Seminary in New York, bears the same inscription and was probably written by the same scribe. The Megillat Scroll was in Vienna in the 1920s, and around 1950, the scroll entered the collection of the Israeli ambassador to Austria, Eliahu Sachar. He brought the scroll to Israel. 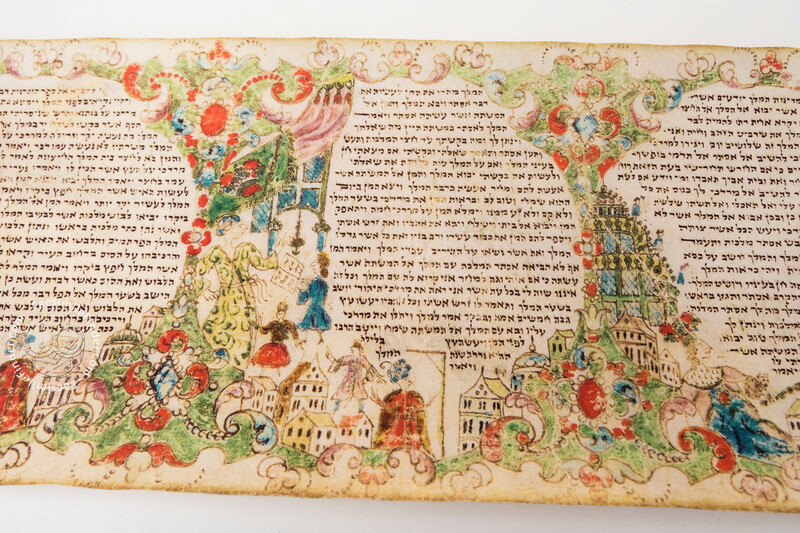 An American collector bought the lavishly decorated scroll and it eventually returned to Israel, where it is kept in the collection of the Gross family. 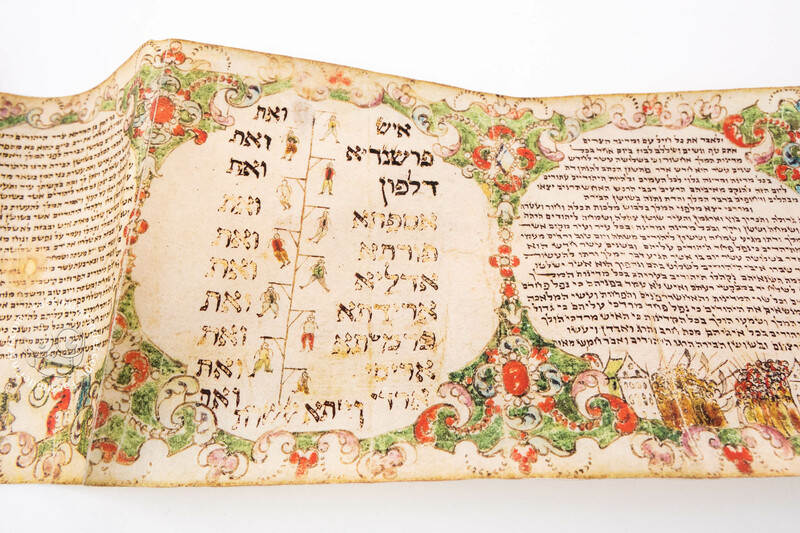 Full-size color reproduction of the entire original document, Megillat Esther: the facsimile attempts to replicate the look-and-feel and physical features of the original document; pages are trimmed according to the original format; the binding might not be consistent with the current document binding. 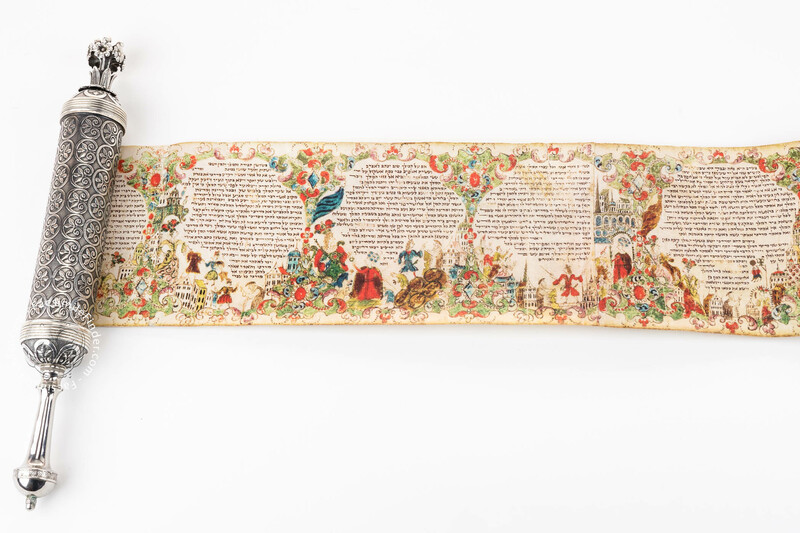 Parchment hand-made in England by one of the world’s finest parchment makers is used for this facsimile edition. In the commentary volume, the authors intersperse their introduction with discussions of the materials used for the creation of the scroll, the nature of the Hebrew script used, the localization and the dating of the scroll, the delicacy of the silver case and the question of what came first, the text or the images. 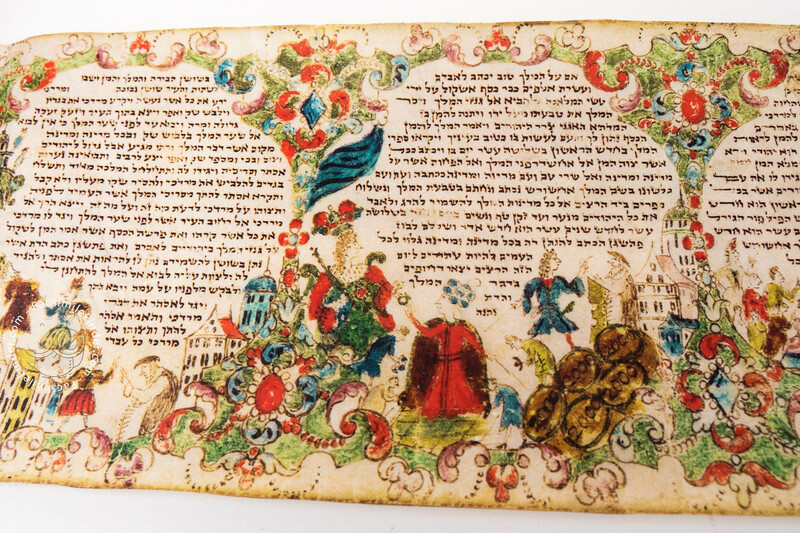 They also provide, both through historical elaboration and additional black and white images, further background information on the iconography of the scroll, parallel themes and motives in other scrolls, the printed sources behind the illustrations, customs pertaining to the Purim festival, and the cultural background of the scroll’s assumed patrons. Case copied by hand faithful to the original. Each case is hallmarked and individually numbered, and the edition is accompanied by a signed and numbered certificate.